Should You Use a Broker in NYC to Sell Your Home? One of the most frequently asked questions we receive is should you use a broker in NYC. The answer depends greatly on whether you’re looking to rent, buy or sell in New York City. 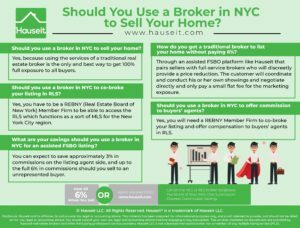 So should you use a broker in NYC to sell your home? Surprisingly, the answer is yes, but not in the manner you would expect. While we don’t recommend home owners to agree to paying 6% to a traditional real estate broker, using the services of a traditional real estate broker is the only and best way to get 100% full exposure to all buyers. This is because listing your home FSBO (for sale by owner) on a popular consumer website will result in buyers’ agents not showing your property to their clients. Moreover, the 30,000 licensed real estate agents in NYC without much to do (generally your bottom of the barrel types) will be cold calling you and emailing you to tell you exactly that. You can expect to throw away your phone number and email address after such an experience as the cold calls won’t simply stop after you’ve de-activated your listing. So how do you get a traditional broker to list your home without paying 6%? No full-service broker will risk his reputation among his local professional network by openly discounting his services. Not only will he lose face with other brokers, he may also suffer punishment from other full-service brokers. Keep in mind that almost every real estate transaction requires the cooperation of two agents for it to happen (i.e. buyers’ agent and listing agent). Because the broker does not want to offend his fellow agents and potentially damage his ability to transact with other agents, the full-service broker will typically refuse any type of discount services. The only way to get around this issue is with an assisted FSBO platform like Hauseit that introduces the customer to a full-service broker who will discreetly provide a price reduction. The customer will conduct some of her own open houses, coordinate her own showings and negotiate by herself in exchange for a greatly reduced rate of commission owed to the listing broker. To the outside world, no one should be aware of the fact that the affiliate listing broker has not charged the customer the traditional, full 6% in commission. 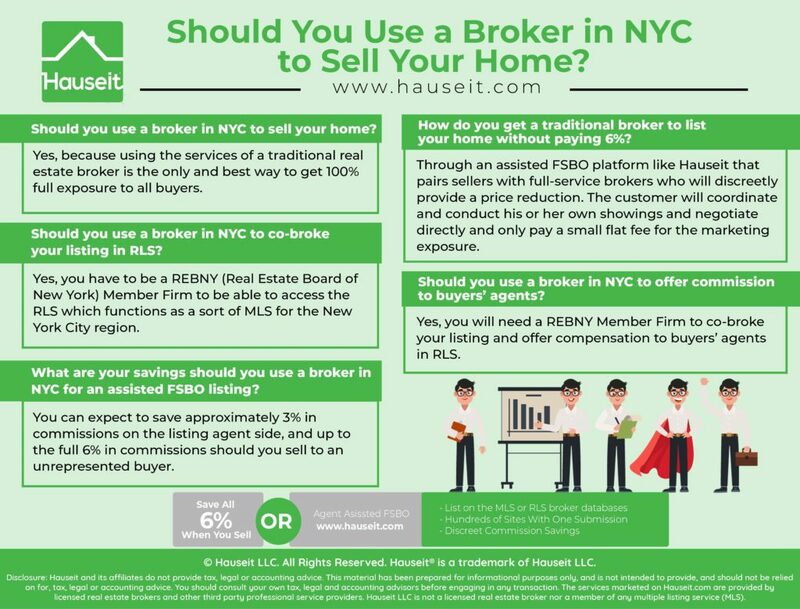 Should you use a broker in NYC to co-broke your listing in RLS? Yes, you have to be a REBNY (Real Estate Board of New York) Member Firm to be able to access the RLS (REBNY Listing Service) which functions as a sort of MLS (i.e. multiple listing service, an inter-broker database to facilitate cooperation on listings) for the New York City region. Beware of spending upwards of $1000 on such services as you will generally end up being listed in the NY State MLS or the Long Island MLS, both of which are irrelevant to NYC. While there is a Manhattan MLS, it is not very popular vs. REBNY which has over 16,000 members. Moreover, some of these larger “for sale by owner” websites clearly do not work, and absolutely will not work for NYC. The reason is that listing with them will be the same as listing FSBO. Not only will local brokers recognize the FSBO broker (which sometimes shockingly enough even has the word “for sale by owner” or “FSBO” in their company name), they make it even easier by sometimes syndicating their listings as a FSBO listing to sites such as Zillow, complete with watermarked photos of their FSBO company name. Ironically, there are services such as BrokersMust that actually sell lists of these FSBO listings to hungry brokers looking for new clients. Should you use a broker in NYC to offer commission to buyers’ agents? Yes, you will need a REBNY Member Firm to co-broke your listing and offer compensation to buyers’ agents in RLS. The average commission offered to buyers’ agents ranges between 2-3%, which is almost always half of the average 5-6% total commission. To be competitive with other listings in your area, you may want to consider offering a commission percentage to buyers’ agents which doesn’t result in ethically questionable agents steering their clients away from your property simply because the commission is too low. Even though this sort of behavior is an illegal, anti-competitive practice which is difficult to prove, one must assume that it does happen to a certain degree. While offering more than 3% is an interesting idea, the cost of paying more is usually not necessary. Over 90% of buyers start their search online, and although you will have more motivated buyers’ agents, they have less power than you think in terms of steering their clients to choose one property over another. That does not mean however that they don’t have power to exclude a FSBO listing altogether. After all, most agents don’t have an exclusive relationship with buyers in NYC so they can’t reasonably be expected to work for free. What are your savings should you use a broker in NYC for an assisted FSBO listing? You can expect to save approximately 3% in commissions on the listing agent side (less the several hundred dollars owed to Hauseit), and up to the full 6% in commissions should you sell to an unrepresented buyer. If you choose to sell to a represented buyer, you will be obligated to pay whatever percentage commission you authorized our affiliate listing broker to co-broke in RLS.